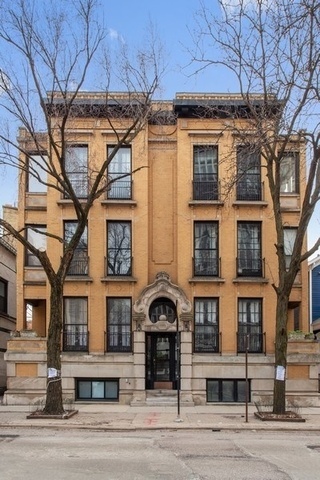 Sunny east Lincoln Park duplex with loads of character in gorgeous classic brick & limestone vintage building. Home features hardwood floors throughout, stainless steel and granite kitchen, and updated baths with beautiful wall coverings. Multiple outdoor spaces including gorgeous common area with fire pit. Living room with beautiful windows and private terrace, large dining room and eat-in kitchen with breakfast bar. Private entrance to home via lower level feels like single family home living! Extremely quiet throughout unit, despite premier location on this beautiful stretch of Fullerton. Plenty of storage. On-site garage parking included. Walk to everything--the lake, parks, the zoo, the nature museum, coffee shops, restaurants, shopping, grocery, the El, Latin, Parker, and Lincoln. The very best of city living, welcome to everything Lincoln Park has to offer! Property information last modified by seller on Tuesday, April 09, 2019, 02:59 PM CDT. Information Deemed Reliable But Not Guaranteed. Unauthorized duplication, use, or linkage is prohibited. The information on this web site is for personal, non-commercial use and may not be used for any purpose other than to identify prospective properties consumers may be interested in purchasing. Monthly Payment Calculator results are for illustrative purposes only, not a financing opportunity; calculations assume a 30-year fixed-rate mortgage and do not include closing and other costs. Property Tax on NEW properties is estimated at 1.5% of Listing Price for payment calculation purposes; actual value may be higher or lower.